Part I Computability and Ordinal Logics. 1937 On Computable Numbers, with an Application to the Entscheidungsproblem (P.Lond.Math.Soc.(2)42,230-265). 1937 Computability and &lgr;-definability (J.Symb.Log.2 153-163). 1937 The p-function in &lgr;-K Conversion (J.Symb.Log.2,164). 1938 Systems of Logic based on Ordinals (P.Lond.Math.Soc (2) 45,161-228). General Introduction to Turing's work on Type Theory. 1942 A Formal Theorem in Church's Theory of Types (with M.H.A.Newman). (J.Symb.Log.7). 1942 The Use of dots as Brackets in Church's System. (J.Symb.Log.7, 28-33). 1948 Practical Forms of Type Theory (J.Symb.Log.13, 80-94). 1941 Some Theorems about Church's System. 1943-4 Practical Forms of Type Theory II. 1944-5 The Reform of Mathematical Notation. Part III - Enigmas, Mysteries and Loose Ends. Turing's Treatise on the enigma. Excerpts from the "Enigma Paper". The Nature of Turing and the Physical World(Andrew Hodges). Letter from Robin Gandy to Max Newman. Royal Society Memoir (Max Newman). Lists of contents of other volumes. Appendix:matters arising from other volumes. 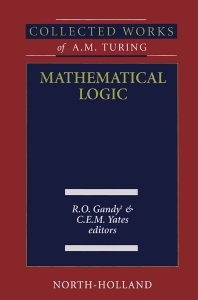 Mathematical Logic is a collection of the works of one of the leading figures in 20th-century science. This collection of A.M. Turing's works is intended to include all his mature scientific writing, including a substantial quantity of unpublished material. His work in pure mathematics and mathematical logic extended considerably further; the work of his last years, on morphogenesis in plants, is also of the greatest originality and of permanent importance. This book is divided into three parts. The first part focuses on computability and ordinal logics and covers Turing's work between 1937 and 1938. The second part covers type theory; it provides a general introduction to Turing's work on type theory and covers his published and unpublished works between 1941 and 1948. Finally, the third part focuses on enigmas, mysteries, and loose ends. This concluding section of the book discusses Turing's Treatise on the Enigma, with excerpts from the Enigma Paper. It also delves into Turing's papers on programming and on minimum cost sequential analysis, featuring an excerpt from the unpublished manuscript. This book will be of interest to mathematicians, logicians, and computer scientists.